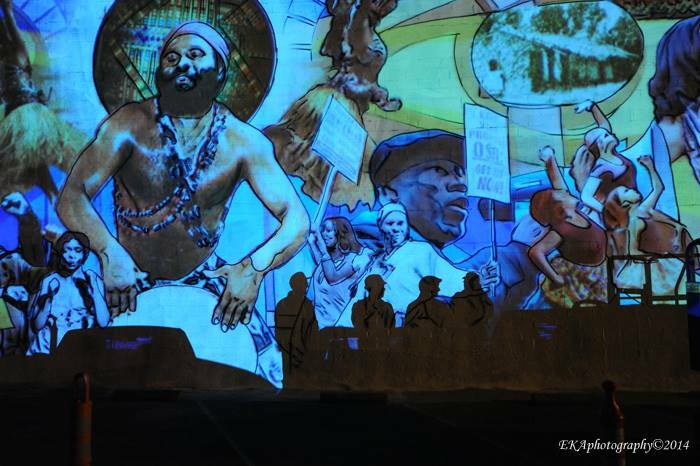 (Oakland, CA) — The Community Rejuvenation Project, an Oakland-based non-profit organization specializing in community murals, proudly announces Phase I of the Alice Street Mural Project, which runs from July 2 -Aug 3rd, 2014. 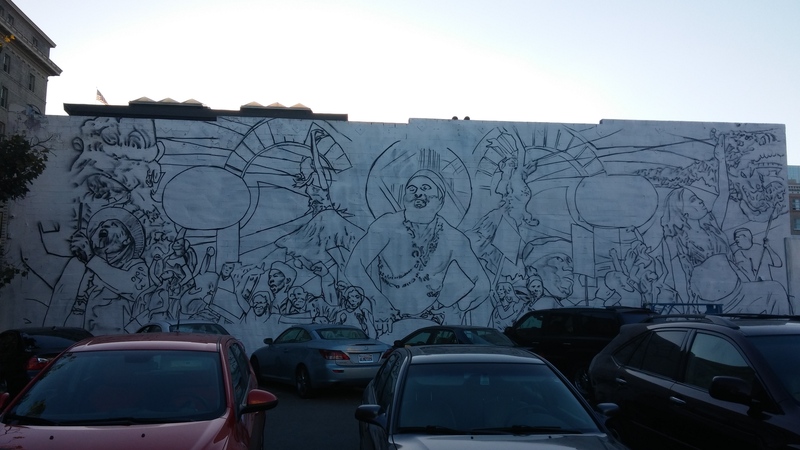 This mural project will encompass painting three large walls surrounding the parking lot at 1401 Alice Street (opposite the Malonga Casquelord Center and facing the historic Hotel Oakland.) 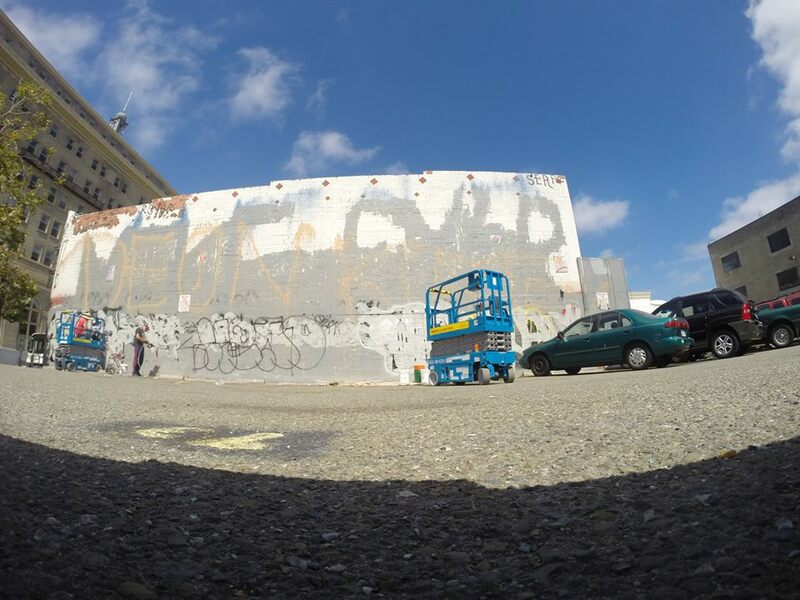 The walls cover an approximate surface area of 2500 ft., and have been repeated targets for blight and tag vandalism prior to the mural’s commencement. 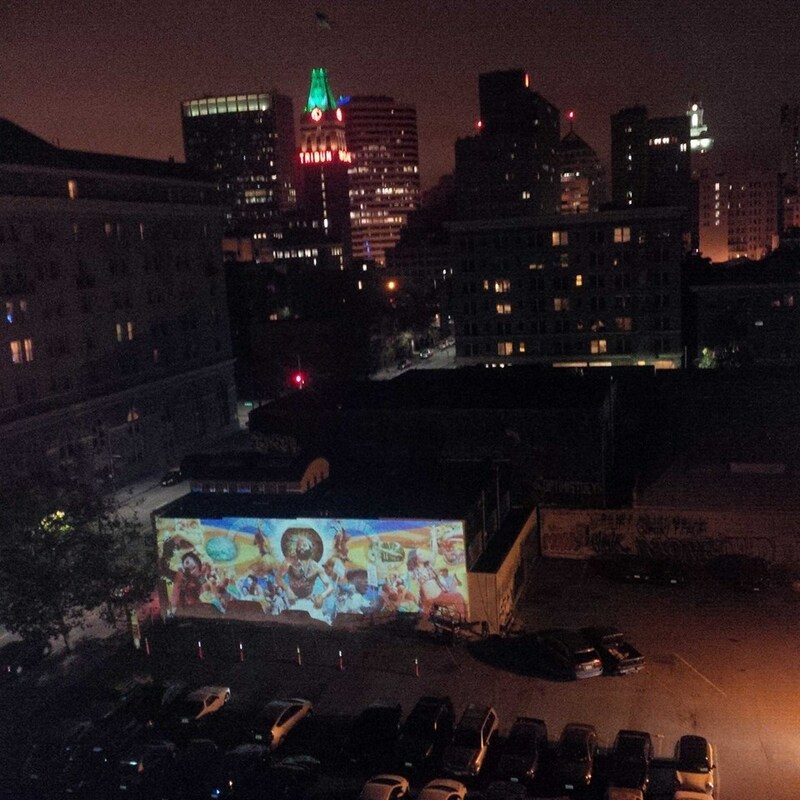 The view of the mural projection from the top of the Malonga Casquelourd Center. Photo by Theo Williams. The groundbreaking on the Alice Street Mural Project comes after CRP conducted 6 months of intensive research, including a thorough internal mural design process, conducting first-person interviews, reviewing archival photos and other historical material, attending and filming numerous performances by Malonga-based dance companies and Hotel Oakland residents, navigating institutional bureaucracy, holding numerous community meetings which provided neighborhood input into the design process, hiring a Cantonese translator, and producing a successful IndieGoGo crowdfunding campaign and two trailers for an upcoming accompanying documentary film project, directed by Spencer Wilkinson. The design after projection. Photo by Desi Mundo. The mural groundbreaking is only the beginning; CRP also plans to hold community painting days (TBA) , encouraging participation from local residents, and giving them ownership of “their” mural. Phase II of the project is scheduled to begin in August; a block party/community celebration featuring live music and dance will be held at the completion. To schedule an interview with Desi Mundo, or obtain press photos, call 510-269-7840 or email CRPBayArea[at]gmail.com.